My mom has been telling me ever since I was a little girl that I have a very good “wanter” and I’m sure my husband would agree. I am very good at wanting things, dreams, goals, ideas, etc. to the point that I get very impatient that the timeline to my goal (rational or not) is not able to be quickly achieved. Wow, I’m starting this post off well. In two sentences I showed my impatience, my materialism, and my pride. Sigh. What our desires for increase, or goals, lead us to. The first one is obvious and has already been covered extensively by extremely knowledgeable people. In a nutshell, with our eternal perspective, we recognize that our goals need to be focused on and centered in becoming like Christ. Our goals, in big or small measure, need to be supportive of our main life goal to return to live with Him. I get that. For me, the long term goals are easy. Sometimes I get a little tripped up in the short term goals, but that’s because I need to solidify my understanding of the second thing. We are a one income household in a two income economy. Not only that, but we are commanded to pay a tithe of 10% of that to the Lord. We can achieve more by either making more money, or making better choices with our money. Short term we can get more stuff with more money, but long term we can have more freedom by making better choices and are blessed by the Lord for our sacrifice to Him. Personal study and church callings. We are committing our time to the Lord. We will run ourselves ragged by thinking we can add more responsibility into our already busy lives, though in the short term it may seem to work. We can only magnify our service to Him as we recognize that we need to sacrifice some of our own activities and choose better to add in His activities. Virtues. We cannot add patience without sacrificing impatience. We cannot add obedience or humility without sacrificing pride. We cannot become faithful without sacrificing our fear. We cannot become Christlike without sacrificing the natural man in us. The Lord obviously desires us to increase by making better choices, or by sacrifice. When we seek to increase by searching for MORE, more money, more time, more stuff, we become entrapped in the idea that we deserve all that we have, and more, because of OUR hard work and we feel a sense of entitlement and jealousy for what others have that we don’t. Let’s face it. A lot of times getting more is initially easier than sacrificing. Sometimes it is extremely tempting to give up being a stay at home Mom so I can have my dream of my house on the lake, or at least a closet full of pretty shoes. Sometimes it’s tempting to pay for a trip to disneyland instead of paying tithing or saving for retirement. The desire is strong to want more NOW instead of sacrificing, having less now, and way more long term. Through the sacrifices we make the Lord shows us that everything we have was given to us not because we deserve it, but because he loves us and desires to bless us. He’s not asking for more from us, he’s asking us to be better, use better, and choose better with what we already have and in doing so he blesses us with increase far greater than our mortal minds understand or comprehend. The Atonement of Jesus Christ works in sacrifice. 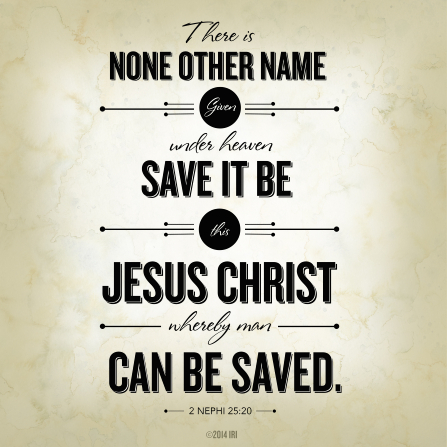 The Savior sacrificed all for us to give us the gift of eternal life. To receive that gift he is only asking that we sacrifice our own short term desire for more, our natural man, for the long term glory greater than our comprehension. As I continually gain greater understanding that when I give up having more earthly stuff now for far more eternal blessings in the future the easier it is to make those short term goals that support my long term goal of returning to live with Heavenly Father.